There are more than one million Japanese azaleas growing on the Gomiikehafu Highland and some 600,000 growing on the Yunomaru Highland--the greatest number in the Kanto region. Both these areas were previously used as farmland, and the Japanese azalea communities were maintained because the cattle ate other plants and left the azaleas. Rare alpine butterflies also live within these communities. 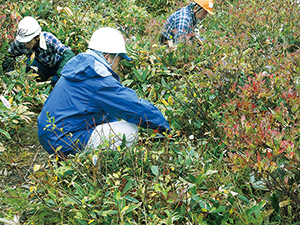 In recent years, grazing has decreased, and there is concern about the decrease in Japanese azaleas. On the Yunomaru Highland, the Asama International Outdoors and Nature School-- a local NPO park management group--has concluded a scenic site conservation agreement with the owners of the land and maintains the Japanese azalea communities by clearing away tall trees as well as weeding bamboo grass, etc. 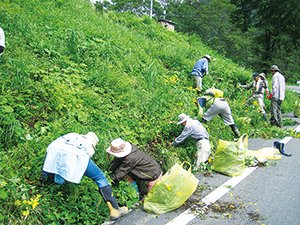 Invasive plants such as golden glow and bitter wintercress are weeded out with the cooperation of members of the local community because they have the potential to drive out native species due to their tremendous reproductive power.